While most of my autographed pucks are from players, this one is of a broadcaster. 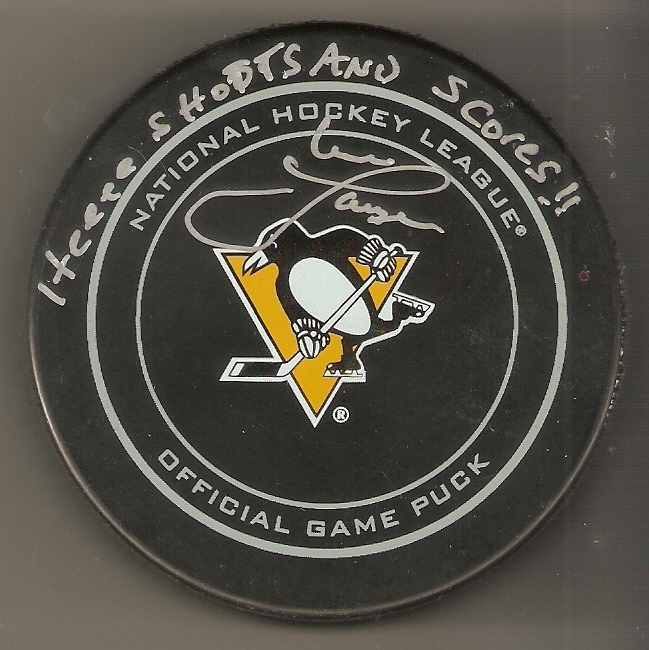 While perusing through items on Total Sports Enterprises' website, equipped with my coupon code, I came across this autographed puck from long-time Pittsburgh Penguins broadcaster Mike Lange, and just had to have it. Lange began calling Penguins games for both radio and television in 1974, but left the team after just one season due to the organization's financial instability. He would return for the 1976-77 season and called all televised games until the team went in a different direction in 2006, not renewing his contract. Many Penguins fans were not happy at all with the decision, but he would soon sign on to do the team's radio broadcasts alongside former Penguin and two-time Stanley Cup Champ, Phil Bourque. 2016-17 was his 40th consecutive year calling Penguins games. Lange is most known for many of his trademark expressions, such as "He doesn't know whether to cry or wind his watch," "He beat him like a rented mule," "Buy Sam a drink, and get his dog one, too," and "Scratch my back with a hacksaw," among others. I honestly have no idea what many of them mean, but his two most famous ones are more clear, "Ladies and gentlemen, Elvis has just left the building (Penguins win the game)" and the one I got inscribed of the puck, "HEEEEEEEE SHOTS AND SCORES!!! (Penguins goal.)" I grew up an hour south of Pittsburgh and despise the Penguins. However, I loved listening to Mike Lange call games. He's certainly one of the best I've ever heard.